The lion is can be found in parts of eastern and southern Africa, and is commonly protected in reserves. Since the early 1950's, the lion population in Africa has been reduced by half. Today, fewer than 21,000 lions remain in Africa. Because lions live on the plains and in large, open spaces, they are easy targets for sports an trophy hunters. Another danger for lions is a loss of habitat and agricultural expansion, as well as poisoning by livestock ranchers. These beetles have successfully freeloaded for 100 million years - An ancient and rare beetle fossil is the oldest example of a social relationship between two animal species. 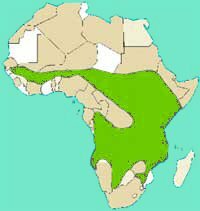 This is the area in Africa where Lions live.